certain ones were the containers of the life-force with all its mystery." There is something intrinsically appealing to many of us about the rounded contours of a beach stone worn smooth by the action of ocean waves over time. We have been drawn to picking them up from beaches ever since we were children. 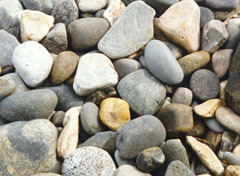 The southern coast of Maine has some wonderful beaches covered with these stones. 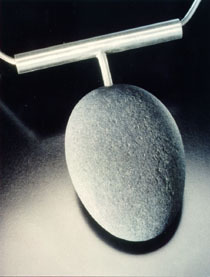 Since the debut of her first Beach Stone Pendants in 1993, jewelry using these stones has become an important part of Elizabeth's line. Design elements are purposely kept to a minimum in these pieces in an attempt to honor the stones for their own inherent simplicity and beauty. Best in Design, League of New Hampshire Craftsmen's Annual Exhibit, 1993. 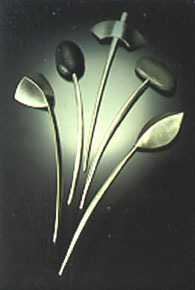 Modern Category Award, Accent 8th Annual Silver Design Competition, 1994. Click here to hear more ocean waves!